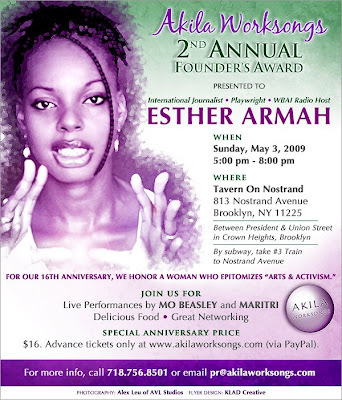 I am happy to announce that on Sunday, May 3, 2009, AKILA WORKSONGS, Inc. will honor Esther Armah with its 2nd Annual Founder's Award. 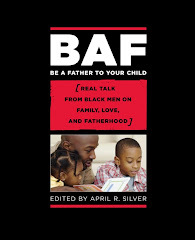 Ms. Armah is an international journalist, playwright, and radio host on WBAI 99.5 FM Radio in New York. Deeper than that, she's a woman of great character. If you were with us this time last year, you'll recall our 15th anniversary celebration at Joe's Pub. Over 200 hundred people sold out the venue and we had a magical time! Between performances, we presented the first Founder's Award to Nana Camille Yarbrough. This year, it's Esther's turn on the "throne." The concept behind the award is to, either during or near our anniversary month, lift up those who epitomize what we call arts & activism - the very context for why we were founded in the first place. We're humbled to be surrounded by such great artists and activists and this gift is our way to say THANK YOU! So if you have listened to and enjoyed Esther's work on WBAI radio, been to any of her dramatized readings, or just had a dynamic conversation with her, then come out and show your love. The details are below. Feel free to forward this to a friend.